10 Things Even the Savviest Aunties Don't Know About Thanksgiving! New York, NY – November 19, 2018 – Melanie Notkin, lifestyle personality, bestselling author, and founder of SAVVY AUNTIE, the media and lifestyle brand heralded as a celebration of modern aunthood, announces the 10th Annual Savvy Auntie Coolest Toy Award winners. Since 2009, the Savvy Auntie Coolest Toy Awards list has guided aunts, and all secondary caregivers, to find the toys and games at the top of kids’ holiday gift wish-lists. 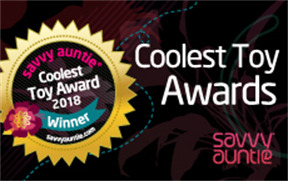 The 10th Annual Savvy Auntie Coolest Toy Awards is designed with the PANK® (Professional Aunts No Kids) in mind. PANKs is the demographic term coined by Melanie Notkin in 2008 for the growing cohort of female consumers who are not moms by circumstance, challenge, or are childfree-by-choice - and have a special bond with a child in their life. A new national study of PANKs by Melanie Notkin, and her strategic market research partner, Michael De Cicco entitled: GENERATION PANK: The Social & Economic Influence of PANKs - Professional Aunts No Kids, affirms that PANKs are an affluent, well-educated, emergent consumer tribe. With a conservative estimate of 2.5 nieces and nephews per PANK, these generous aunts collectively spend an whopping $61 billion annually on the babies, children and teens they love. This annual spend includes the $168 PANKs spend on gifts per niece and nephew at the holiday season - including a portion of the $241 they spend on toys and games for each niece and nephew throughout the year. This new market opportunity does not include the average $1,521 PANKs spend on occasional big-ticket items, or the average $232 PANKs spend on newborn niece and nephew gifts, or the $160 per niece and nephew PANKs spend on Auntventure Days – special days Auntie carves out to spend with the children she loves. To help these Savvy Aunties give the coolest toys and games this holiday season and all year-round, Melanie Notkin spends the year meeting with toy manufactures, toy industry experts, and toy analysts to discover and evaluate the latest ground-breaking toys and games - adding her own “Savvy Auntuition” to complete her list of award winners. Coolest Newbie Finds: Hairdorables; Cutetitos; The smART sketcher Projector; Nintendo Labo Toy-Con Variety Kit - and more! Founded by Melanie Notkin, SAVVY AUNTIE is the media and lifestyle brand for cool aunts, great-aunts, godmothers, and all women who love kids, heralded as a modern celebration of aunthood. Notkin launched SavvyAuntie.com in 2008 and it remains the first and only resource for this demographic, and specifically the PANK® or Professional Aunt No Kids market niche. Savvy Auntie includes a popular and engaged social media following, Auntie’s Day® - a national day celebrating aunts and godmothers, and Melanie Notkin’s national bestseller: Savvy Auntie: The Ultimate Guide for Cool Aunts, Great-Aunts, Godmothers and all Women Who Love Kids (Morrow 2011).